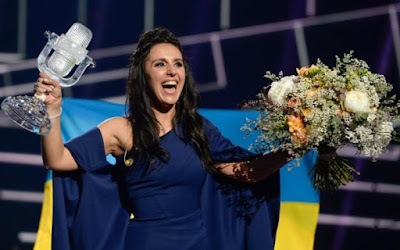 KIEV, Ukraine -- While Ukrainians basked in their Eurovision win on Sunday, Russian officials and Kremlin-friendly media offered up a string of conspiracy theories to explain the win of Crimean Tatar singer Jamala, whose song “1944” was largely seen as a jab at the Kremlin. Ukraine's Jamala reacts after winning the 61st annual Eurovision Song Contest (ESC) at the Ericsson Globe Arena in Stockholm, Sweden. And some officials said Russia should boycott the song contest next year, since it is set to be held in Jamala's homeland of Ukraine. The usually kitsch song contest took on major political overtones this year, as Ukraine's Jamala squared off against Russian singer Sergei Lazarev in a showdown that many Eurovision fans saw as a continuation of the ongoing war between Russia and Ukraine. When Jamala came in first place with 531 points versus Russia's 491 late Saturday, Russia's state-run media seemed to have a hard time coming to terms with it. Franz Klintsevich, deputy chairman of the Federation Council Committee on Defense and Security, said “if nothing changes in Ukraine by next year, then I don't think we need to take part (in Eurovision there)” in comments to the RIA Novosti news agency. Interviewing Mr Lazarev after he came in third, Russia's state-run television channels presented Mr Lazarev as the “champion,” apparently hinting that the official results did not matter. Soon after, the hashtag “Lazarev is our winner” began trending on Russian Twitter. Kremlin-controlled media quickly went into overdrive in attempting to smear the contest, with RT running a bizarre piece titled "Eurovision Song Contest funded by TV license fee system that criminalizes poor people." The sore reaction wasn't limited to social media and media outlets, however. Even Filipp Kirkorov, another Russian singer who took part in the event, seemed to have a hard time being gracious in the wake of Russia's defeat. While acknowledging that Jamala was the winner, Kirkorov said the new voting system used in the contest was to blame for her win, claiming that Lazarev should have really won. Russian officials quickly began to dismiss Jamala's win as unfair and illegitimate. Russian lawmaker Yelena Drapeko blamed Russia's loss on the "information war" being waged against the country, a claim that was echoed by Russian television channels. "Partly, this is a result of the propaganda and information war that is being waged against Russia. We are talking about the general demonization of Russia – about how everything with us is bad, about how our athletes are all doping, our planes are violating airspace – all of this, of course, shows (in Eurovision),” Ms Drapeko said in comments to Russia's TASS news agency. Alexei Pushkov, the head of the State Dumas Foreign Affairs Committee, lamented that Eurovision had “turned into a field for political battles” on Twitter, a thinly veiled criticism of organizers for allowing Jamala to perform a song with political themes. In early March, Russian officials sought to persuade Eurovision organizers to ban Jamala's song, arguing that it was a politicized attempt to make Russia look bad for its policies in Crimea and the subsequent conflict with Ukraine. Organizers disagreed, however, and let Jamala perform the highly charged song. Goodness gracious.....the Russians are threatening Ukraine with the loss of Russian tourism for next year's Eurovision contest. The last time their tourists came to Ukraine they all seemed to be wearing green uniforms with no markings.